1. Pure carbon and catalyst metals, pressed into a graphite, are put into a small cylinder, and then placed in a growth chamber. 2. The growth chamber is placed into a BARS apparatus consisting of a steel outer anvil and a tungsten carbide inner anvil. 3. For 3-5 days, the growth chamber will undergo extreme temperatures and pressures (1400 °C and ~880,000 pounds per square inch). 4. Once the ideal conditions are reached, the graphite dissolves into a molten metal solution, and the carbon atoms slowly build upon a crystal structure. 5. Once the capsule finishes cooling, cracking open the growth chamber reveals a rough diamond ready to be cleaned and cut. Different types of metals added to the growth chamber will change its color. Eg. Boron will result in a blue diamond. Where Did All The Canadian Silver Coins Go? At one point in time it was very common to see circulated silver coins. On January 2nd, 1908 when Canada opened its first Royal Mint in Ottawa, the “first coin” (half-dollar) was a silver coin (92.5% silver/7.5% copper). From then until the late 1960s, Canada, much like everyone else, produced silver coins, with exception to the penny (bronze) and the five cent (nickel). 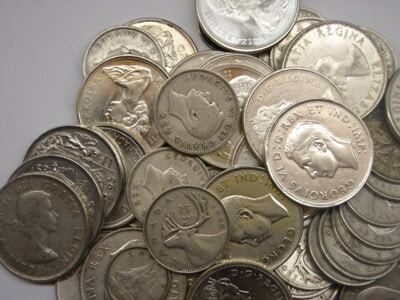 But the 1960s marked the death of silver currency coins. It wasn’t just Canada, but most countries around the world were making nickel or copper-nickel coins. Seeing a silver coin nowadays is a treat. They have become collectible pieces where their numismatic (collectors) value and silver value are far higher than its face value. What happened in the 1960s? Where did all the Canadian silver coins go? The beginning of the end of Canadian silver coins can be traced as far back to World War I. The reason for this is because the silver content in coins depended on the spot price of silver. Between 1908 and 1919, Canadian silver coins were made with 92.5% silver. However, after 1919 (the end of WWI), almost all Canadian silver coins contained 80% silver. 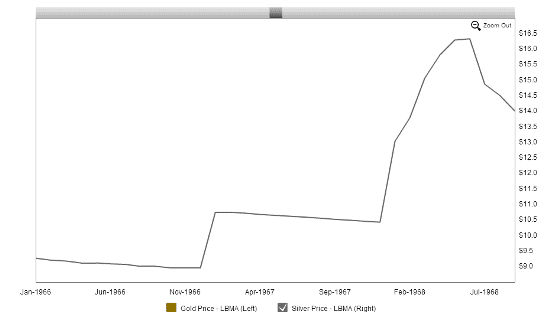 Looking at the graph below you can see that between 1914 and 1919 the price of silver jumped from $0.50/oz to over $1/oz. In other words, the war’s affect on silver prices influenced Canadian silver coinage. Up until 1922, the five-cent coin was originally made with silver, but was converted to nickel (hence its name) to reduce the cost to make the coins. Although silver prices dropped in the 1930s ($0.25/oz in 1932), this did not mean that Canadian coins would revert to 92.5% silver or that the five-cent coin would once again be made with silver. After the Great Depression and World War II, silver prices would begin to climb again, marking the next stage in the death of the Canadian silver coins. 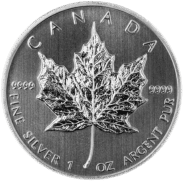 In 1968, Canadian silver coins would take another hit to their silver content, going from 80% to 50%. Once August rolled around, it became prohibitive to mint silver circulation coins, thus all circulation coins were made with nickel or copper-nickel. Overall, the rise in silver prices had some effect on limiting its use, not just for coins but also for manufactured goods. Not only was it more expensive to use silver in coins, but the demand from silver investors encouraged the metal to be allocated more toward bullion than secondary resources. 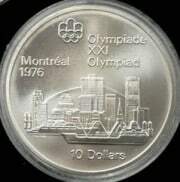 Since 1968, the only Canadian silver coins we see are either commemorative coins or bullion coins. The bullion coin—the Canadian Silver Maples (below; left)—are worth their weight in silver, whereas the commemorative ones, like the 1976 Olympic coins (below; right) are collectibles, and are worth more than just their silver value. Although rises in silver prices killed Canadian silver circulation coins, they have also made them worth far more than their face value. For example, a 1950 twenty-five cent coin is worth roughly $2.50 today. That’s 100 times it’s face value! A famous Marilyn Monroe quote says "diamonds are a girl’s best friend." Then there are some who will say that women are complicated. So does that mean diamonds are complicated too? Most of the value in diamond jewelry is the diamond itself, and evaluating diamonds is not very straightforward because slight differences (differences too small to see with the naked eye) can differentiate the price from one diamond and another quite significantly. In other words, perhaps diamonds are as complicated as girls, and Marilyn Munroe has been on to something all this time. There is a good reason why the diamond industry has certified gemologists in labs to grade diamonds. Unfortunately for the average person, a gemologist is not always available (but you can book an appointment with our Vancouver gemologist today by calling 604-876-4653). If you’re planning on investing in jewelry with diamonds in it, like an engagement ring, read this simple guide to help you better understand what you need to know about buying diamonds. Starting with the 4 C’s—Carat, Cut, Clarity, and Colour—we will help give you a better understanding of the anatomy of diamonds and how they are graded. Carat is the most common thing we think about when the topic of diamonds comes up. Carat is a unit of weight used to measure diamonds. The word comes from the Greek word “carob” which is a plant seed that was used to weigh against gemstones because of their relatively uniform weight. The carat system was eventually standardized where one carat is fixed at 0.2 grams. Although carat measures the diamond’s weight, it can generally determine the diamond’s size. 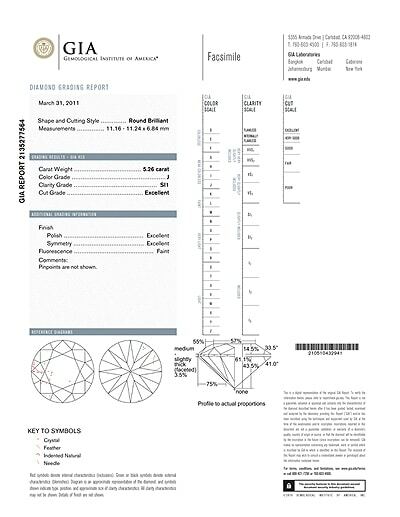 Here is a chart of “round” diamonds showing their carat and their relative size in millimeters. As you go up in carat, the price increases exponentially because diamonds over one carat are far rarer. A two carat diamond is worth more per carat than a one carat diamond of equal grade. What carat is right for you (or your special someone)? If you’re considering an engagement ring, according to www.adiamondbuyingguide.com, in 2013 the average size of the center diamond was 1.1 carats. If you would like to get a better comparison of different diamond sizes, check out this Diamond Size Chart. Often we think of “cut” as the shape or style of the diamond. In fact, shape is entirely different (and will be explained later). Cut actually refers to the “reflective qualities” and is what is graded when a diamond is certified. 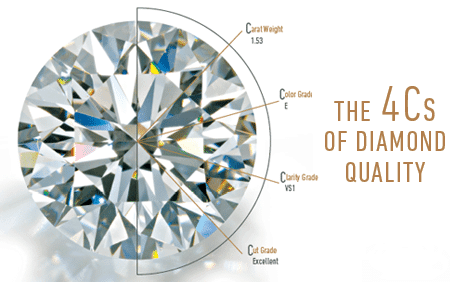 The quality of the cut determines how much light is reflected when it enters the diamond. The reflected light is commonly known as the diamond’s brilliance. The pictures below show the common features of a cut diamond and how light enters different cut variants. Cut grades go from Ideal, Excellent, Very Good, Good, and then Fair & Poor, where ideal cuts maximize the amount of light reflected, and fair & poor cuts only reflects a small proportion of the light that enters them. Grades of clarity assess the overall flaws (blemishes and inclusions) of the diamond. All natural diamonds contain some sort of flaws, hence why flawless diamonds are incredibly rare, and thus incredibly expensive. Blemishes are flaws you can see on the surface, like chips and scratches, and inclusions are flaws found inside the diamond, like bubbles, cracks, and mineral flecks. The more colourless the diamond, the more it will emphasize its brilliance made by the diamond's cut. Diamonds are an expensive investment. The smallest detail could drastically change its value compared to what you paid for it, and you wouldn't even know. If you're buying diamonds or diamond jewelry, make sure it comes with a certificate! 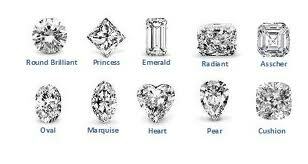 Now that you know the basics of diamonds, you can go out and research what diamond is best for you. BlueNile.com is a perfect place to start to check out diamond prices based on the four C's you just learned about. Or, if you wish to speak to us directly about your diamonds, call 604-876-4653 and book an appointment with our very own gemologist - Rachel Cohen. 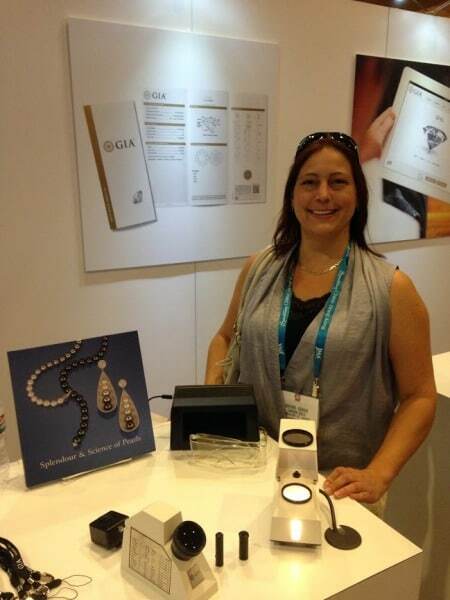 Here she is at the JCK Jewelry Show in Las Vegas June 2014.
or visit one of our convenient locations.